I’ve been invited to talk at some great events during Dying Matters Week 2019. Speakers include President of the Royal College of Physicians, Prof Andrew Goddard; and Professor of Law at the University of Bristol Law School, John Coggon. The day includes insights into creating an environment for compassionate care and how to clear communication in conversations about dying, death and care preferences. It sounds fascinating. Come along and let’s talk about dying, death, writing, public understanding and how we can become less afraid. Now, this sounds like fun. No, really! With music on arrival, bubbly, cake and goody bags, this is the event you can’t afford to miss. Our host will be Virgin Radio’s Amy Voce and we’re promising that we can talk about dying and still make you laugh. Tickets are going quickly: to bag yours look here. This is an open-access event as part of the festival, so feel free to just arrive. There’s more information about this event, and all the other goodies to be experienced in York during their Dead Good Festival, here. Some of these events will include book sales, but I’m always happy to sign copies of With the End in Mind, whenever you bought it. I’m delighted to have been invited to New Zealand for a public speaking tour. I’ll be travelling to NZ as a guest of the Maxim Institute, who have arranged meetings with Parliamentarians, medical practitioners and a public event; more info here. 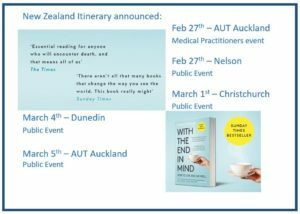 My NZ publisher, HarperCollinsNZ, has kindly added a speaking tour in response to invitations from palliative care services across the islands. I’ll be visiting Auckland, Nelson, Wellington, Christchurch and Dunedin, and trying to fit in some sight-seeing between events. Medical Practitioners’ Workshop hosted by Maxim Institute, with Prof Rod McLeod at AUT. See Maxim Institute link above for tickets. Nelson Tasman Hospice talk and discussion: info and tickets here. All welcome. talk and discussion, Scorpio Books, supported by Christchurch Integrated Palliative Care Services. Info and tickets here. University Bookshop event, venue tbc – more info here. Public Event hosted by Maxim Institute at AUT, with Prof Rod McLeod and Dr Tess Moeke-Maxwell. Tickets available here. All welcome. Tickets selling out! Public Event hosted by Mary Potter Hospice at the National Library of New Zealand. Details and tickets here. All welcome. There isn’t much time between events and travel to see the famously beautiful islands of New Zealand, so do please send your sight-seeing recommendations to me on Twitter @drkathrynmannix or message my Facebook page! Literary Festival Tour 2018: With the End in Mind on the road (and in a boat). I love a good book, and a festival full of books and authors is even better. Over the next few weeks, I’m going to visit a variety of festivals to talk about dying, how we cope, preparing well, what to expect. It seems that telling stories about dying is helping a lot of people: somehow, reading short stories enables us to stay with it, learn new and unexpected things, discover explanations for our own experiences, and become less afraid. Which is just what I’d hoped. Come and join in one of these events, to hear how other people deal with death, and to add your own perspective. I’d love you to say hello. This session is linked to the ‘Death on the Fringe’ festival, so look out for other interesting material while you’re in Edinburgh. Sadly, the brilliant Adrian Owens can no longer join us: his stories in Into the Grey Zone are fascinating and disturbing, and he makes the science easy to follow, so do look out for his book. There will still be a famous face for festival-goers: our Chair will be Sarfraz Manzoor, and together we’ll be discussing death, dying and storytelling. This will be lovely: a chat with Baroness Sheila Hollins, former President of the Royal College of Psychiatrists and a champion for people with learning disabilities. We’ll be using some wonderful paintings in the National Gallery collection as taking-off points for discussing dying, anxiety and how to help people prepare better for the inevitable. You don’t need to walk around, we’ll be projecting the artwork in the National Gallery lecture theatre. Here’s their introduction to the event, and tickets are on sale here. This will be a team effort: joining me for what we anticipate will be a life-affirming conversation will be Palliative Medicine Consultant Dr. Anna Lock and funeral director Carrie Weekes from A Natural Undertaking. We’ll be discussing why we need to talk more about death, and why that helps us get on with life. Come and tell us what you think! Info and tickets here. Greg Wise and I are on a campaign to get more people aware of what happens as we die, to get people talking about their plans and wishes ahead of time, and to improve public understanding of normal, gentle human dying. Greg’s passion comes from the time he spent caring for his beloved big sister, Clare, when she was dying of cancer; he took over her wonderful blog when she wasn’t well enough to keep it going, too. That blog has become their book, ‘Not That Kind of Love,’ and it’s funny, challenging and heart-wrenching. Clare chose not to talk about what lay ahead, and Greg supports that choice but wants the rest of us to think about the impact of not talking. We’ll be chatting about life, death and choices with Cathy Renzenbrink (A Manual for Heartache; The Last Act of Love) about the power of approaching death not with trepidation but with openness, clarity and an understanding that a good death is just as important as a life well lived. Info and tickets here. Greg Wise, my friends! Book early! This beautiful, tiny city hosts a great book festival. I’ll be in conversation with Durham University’s Prof Douglas Davies, who wrote ‘Death, Ritual and Belief: The Rhetoric of Funerary Rites,’ so this promises to dig deep into what we think and how we behave around death and dying. Come and join us; add your view to the mix. Info and tickets here. I’ve been invited to give an evening talk, and host a Q&A, at Conway Hall. No more details yet, but keep an eye on the Conway Hall website. This is so exciting! This year’s Faclan will be held in Stornoway, and the theme is Fear. I am thrilled to be heading over the sea to the Outer Hebrides to join in, and I really hope we’ll have a fantastic festival on the wonderful island of Lewis. Come and explore why we are afraid of death, and how facing the fear helps us to live, as well as die, better. Dying Matters Week 2018 – book tour! 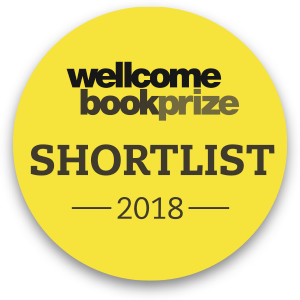 I’m travelling about for Dying Matters Week 2018, on a mini Book Tour. 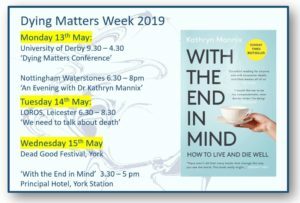 Looking forward to lots of interesting conversations with readers, potential readers, palliative care colleagues and staff of Waterstones and Blackwells book shops who are supporting my book tour May 14th – 19th for Dying Matters Week. Wednesday May 16th: St Mary’s University Twickenham, Senior Common Room, 2 – 3.30pm.